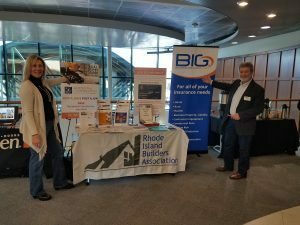 We’re at New England Institute of Technology’s East Greenwich Campus for the 7th Annual Building Officials Expo & Education Fair promoting The Rhode Island Builders Association (RIBA), RCWPJobs.com and Builders Insurance Group (BIG) to attendees and exhibitors from 8:30 am to 2:45 pm. The Expo is FREE for contractors to attend. The Rhode Island Building Officials Annual Construction Expo and Education Fair was started seven years ago, to raise awareness and funding for the Rhode Island High School Construction Vocational Schools. The RIBOA Association and members are proud to be associated with this fine group of students and instructors. The Association initiated an International Code Council building code training program with all the schools, and are proud to announce, that to date, over seventy-five seniors have successfully completed the training and our Association, in conjunction with NETOCH Sales of Warwick and Stanley/DeWalt have awarded each of those students with hand and power tools with a value of over $350 for each student. The proceeds from this event are used to fund this program, so we again want to “Thank You” very much for your support and sponsorship. Earn a great living in the residential construction trades…carpentry, electrical, painting, masonry, HVAC…it’s not just a job, it’s a career. Learn more today! Contact the Residential Construction Workforce Partnership or the Rhode Island Builders Association.